In a clean black finish, this 10 watt dimmable LED track head is an energy-efficient replacement for an outdated 50 watt incandescent model. This contemporary-style dimmable LED track head can be used to update your track lighting system into a more energy-efficient model. This track head uses only 10 watts of energy to produce a light output of 830 lumens with 90 CRI, comparable to the light output of a 50 watt incandescent bulb. It comes in a classy black finish over die cast aluminum construction, and offers 350 degree horizontal coverage and 90 degree vertical aiming capability. Dimming range of 100 percent down to 5 percent. CEC Title 24 Compliant and ENERGY STAR® qualified. Track head is 4 7/16" wide x 2 1/2" high. Total Fixture is 6 5/8" high. Uses 10 watts to produce a 830 lumen light output, comparable to the output of a 50 watt incandescent. 2700K color temperature. 90 CRI. Dimmable LED track head from Juno Lighting. Black finish over die cast aluminum housing. LED lifespan averages 50,000 hours at 3 hours per day. 350 degree horizontal coverage. 90 degree vertical aiming capability. Dimming range of 100% down to 5%. 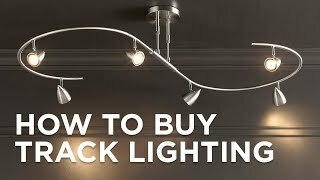 Do you have a black head that puts out a lot of lumens? Good quality. Nice metal. Sleek and modern. Easy install. Crisp black finishes the cone design of this Juno TracMaster low voltage track head featuring 90-degree vertical aiming.